Licensing based on named / dedicated users or concurrent users. 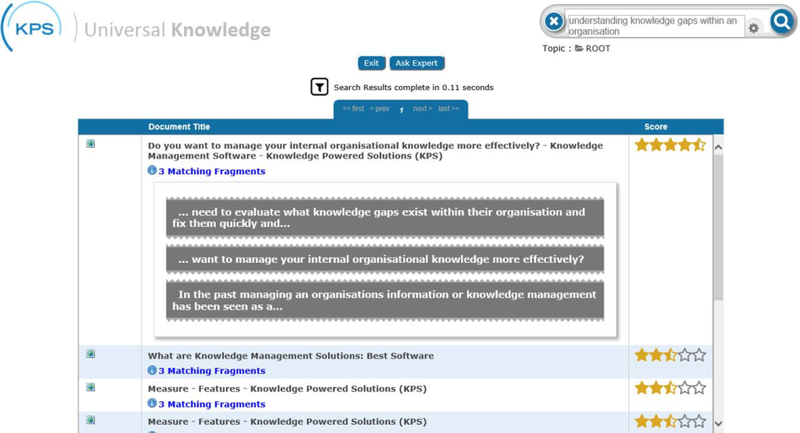 KPS Knowledge Management Software Reviews Recently Reviewed! Comments: The implementation team came on site to provide hands-on server install and customization. During this multi day visit, their team created customized scripting to extract book titles and detailed information to feed the Knowledge Management System. 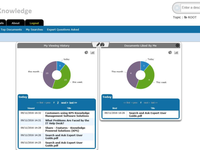 The results are: time saved, the availability of data for the Customer Service Representative (CSR) to speak with agility and on demand knowledge for a 2 minute call constraint. This near real time data originated from another system of record but appears seamless to the CSR. As the software releases become available, KPS staff are proactive to insure our operating system and SQL releases are compatible with the new software. As we refresh to the most current release in 3 weeks, they have committed to Go-To-Meeting and help us to install while they watch to answer our question and develop our internal knowledge. We have built a very solid library of information for repeatable processes, integrity in our data, and quickly implementing new documentation with little confusion. Write authority is limited by access control and the read permissions are wide. Our content library is very stable and well managed, thanks in part to the permissions design. The KPS team has been very responsive to our Information Service team for information. The system has not failed in the 3 years we have used it on our own servers. The KPS tem send out notices of existing functionality as we grown and announcing new capabilities as their product demand grow. Their staff provides personalized support and not dial x for this or that. 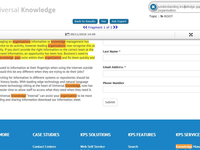 The KPS software has allowed us to annotate procedures which are critical for control and legal compliance. An intentional naming scheme allows us to identify document which need to be reviewed at least annually for payment card compliance. We have nothing but gratitude for this responsive team. The product delivers what is promised and the users determine their destinies. Invest the time to state your usage to the implementation team, listen to their suggested solutions and allow the KPS team to deliver your configured solution. The product is affordable. We are very grateful to our KPS partners and their product and rate them very high for ease of use, customer support and commitment to their product. It is an absolute pleasure working with ODBM, we strive to achieve a personalised support approach with each of our clients and are delighted to be recognised for this approach. Pros: I love the support we receive, and the robust functionality. 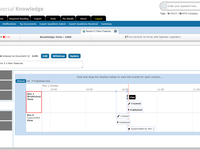 KPS is very open to changes, and are positioned to be adaptive to customer needs. Cons: The UI is not terribly intuitive, which can be problematic. We're not always satisfied with the import functionality. None of these are drastic issues, though. 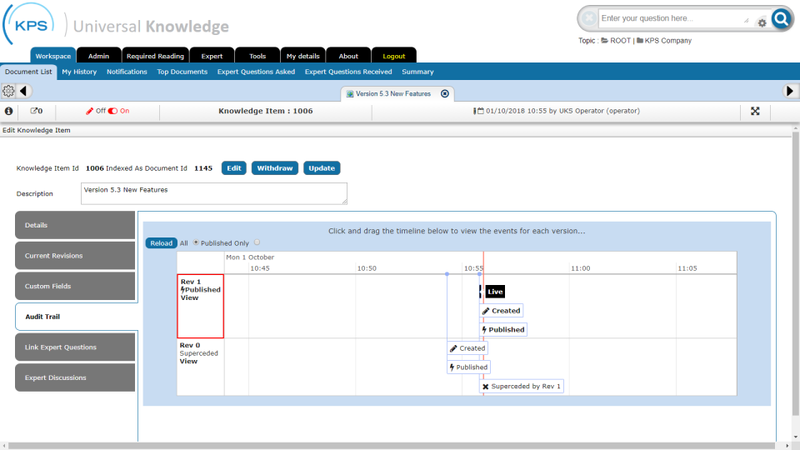 Overall: We've got a strong tool for our customer service team to use as a knowledge resource. The learning curve is a bit steep, but worth it. 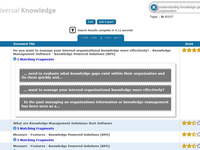 Thank you, we appreciate you taking the time to complete this review of KPS Universal Knowledge. We are grateful for your comments about the depth of functionality and great customer support and we do understand your comments about the UI and the development team is currently working on improvements. 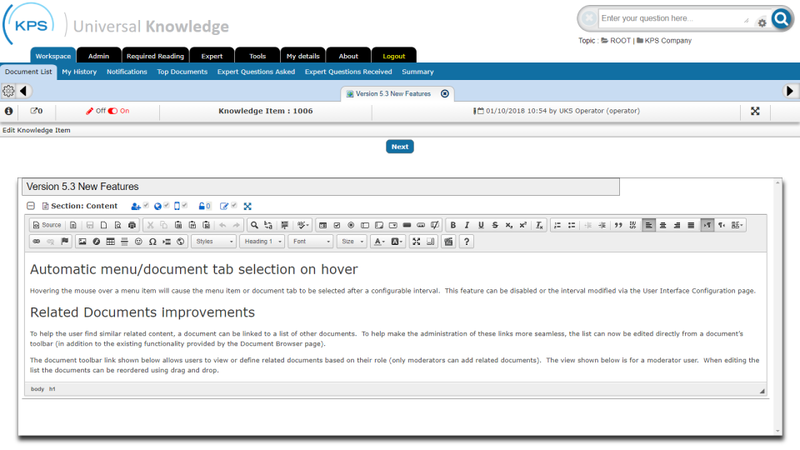 The next release of Universal Knowledge will provide an easy to use intuitive UI that can be configured by end users. Thank you. We have since updated our look at feel of the product, taking on board the comments made by our clients during 2014. We seek to improve the product through customer feedback on a regular basis and seek regular customer feedback and input to create new Universal Knowledge features. Pros: Ease of harvesting knowledge from other systems. The AI like function of linking search phrases to topics. 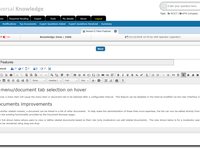 Taxonomy setup and linking of user rights. Management of content and the regular updating of it. Cons: Collaboration between individuals could be more Graphic, but it works well. Overall: With a new generation of South Africans coming into the business market it becomes more and more difficult to mentor everyone in the same way. 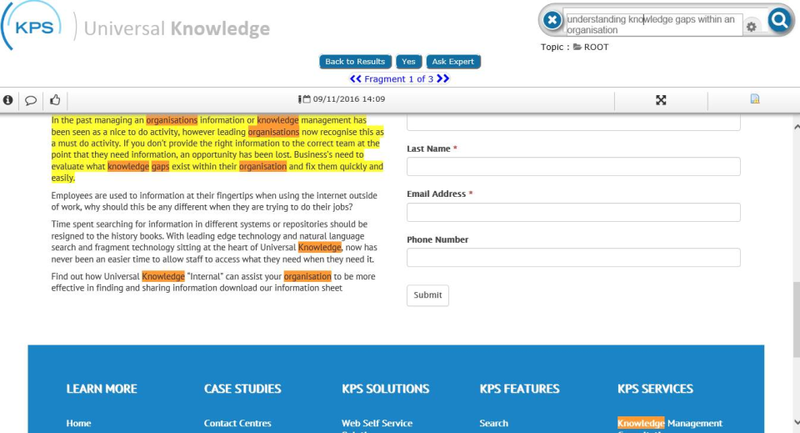 The pressure that internships and learner-ships place on Snr resources is huge, but with KPS KM important knowledge can now be shared and distributed through the organisation as well as over the years. We are delighted to provide and support Credit Suisse with a software product that meets their Knowledge management needs at various locations around the world. Quotes from Shelby include "increased quality and service, with a reduction in messaging errors and scheduling". This is fantastic news for the Patient Access Centre.